Lehigh Hanson parent company HeidelbergCement AG is selling its 51 percent stake in Lehigh White Cement Co. to minority shareholders in a deal valued at about $140 million and scheduled for closing this quarter. Ownership of Lehigh White Cement, which has 280,000 tons capacity in York, Pa., and Waco, Texas, plants, will be split between Aalborg Cement Co. (63.25 percent), a North American business of Denmark-based Aalborg Portland Holding A/S, and Cemex Inc. (36.75 percent). Lehigh White Cement’s signature product binds a 5,500-lb. conference table top at Allentown, Pa., headquarters. Under guidance of interior designers Rudy Hilt and Mike Ondra, Sun Precast of McClure, Pa., fabricated the 26-ft. slab in four sections. 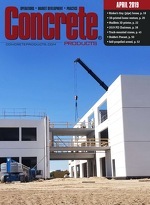 The Lehigh White Cement announcement followed an early-January transaction in which HeidelbergCement subsidiary Italcementi S.p.A. acquired Cementir Italia S.p.A. cement and concrete operations throughout Italy from Cementir Holding S.p.A., the Rome-based parent company of Aalborg Portland Holding. The parent companies of CalPortland Co., Cemex USA, Holcim (US) Inc., Lafarge North America, Lehigh Hanson, Oldcastle Inc. and Votorantim Cement North America are among charter members of the Global Cement & Concrete Association, dedicated to strengthening the sector’s contribution to sustainable construction and offering solutions to social challenges across the world. From London headquarters, GCCA will promote development of durable, resilient and environmentally sensitive buildings and infrastructure at the global level. It aims to foster innovation throughout the construction value chain in collaboration with industry associations plus architects, engineers and technology developers. Members will demonstrate how concrete solutions can meet global construction challenges and sustainable development goals, while simultaneously showcasing responsible industrial leadership in cement and concrete production and use. Membership is open to cement producers worldwide that share GCCA’s values. Founding members are Cemex, CNBM, CRH, Dangote, Eurocement, HeidelbergCement, LafargeHolcim, Taiheiyo and Votorantim.